Compact and rugged design features large backlit display. Displays [T1 plus T2] or [T1-T2 plus T1] or [T1-T2 plus T2]. Selectable units of °F, °C, K (Kelvin). Wide temperature range with 0.1°/1° resolution. Timer function displays elapsed time plus the time when MIN and MAX readings are taken. Data Hold function freezes reading on display. Low battery and overrange indication. Records Max/Min readings for later recall. Complete with built-in stand, protective holster, two Type K bead wire temperature probes and 6 AAA batteries. Basic Type K Dual input. OFFSET key used for zero function to make relative measurements. 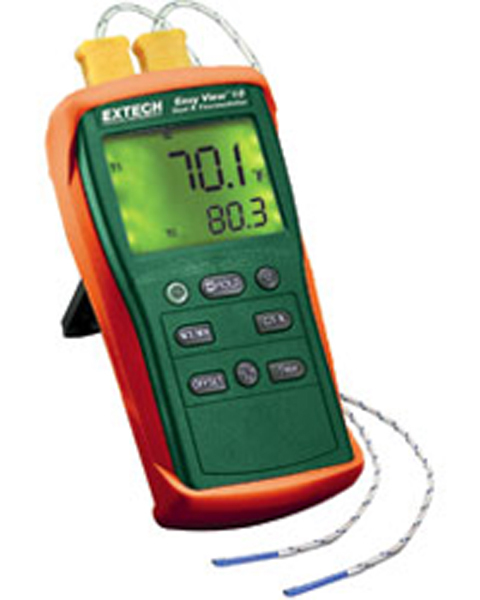 The Dual K Type Thermometer is a digital device with capability of displaying temperature readings in °C or °F. Any kind of K-mode thermocouple can be adopted as the temperature transducer to measure Centigrade and Fahrenheit degrees, and also the temperature difference (double channel thermometer).